Did you know that Twin Ravens Press also offers custom laser engraving for a wide variety of materials and applications? We create a lot of paper goods here, but we also do a fair bit of engraving into wood, acrylic, leather, fabric and other materials too! Check out this awesome collaboration with local Eugene artist Tim Boyden of Out on a Limb Gallery. Tim was commissioned to build this cool driftwood arbor for one of his client’s upcoming weddings and he hired us to engrave the dragonflies in the sign hanging from the top! 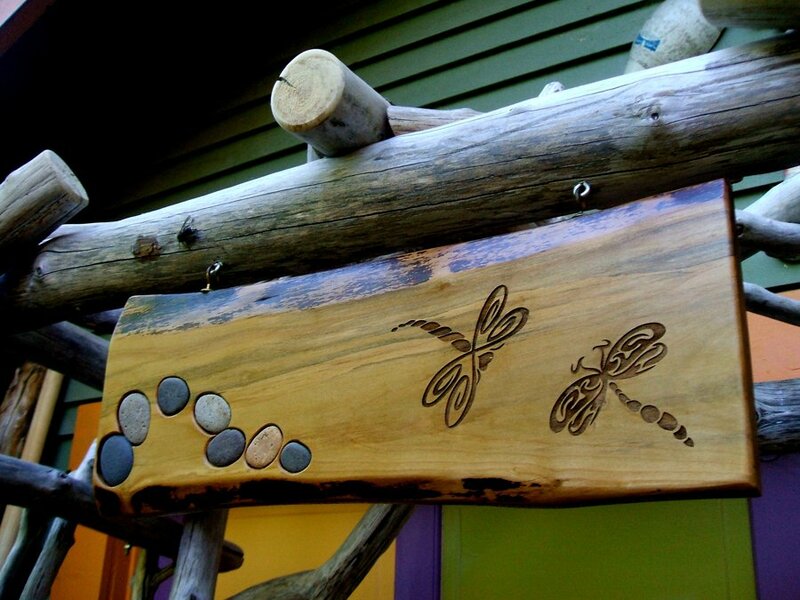 Above is the whole arbor and below you can see detail images of the sign and laser-engraved dragonflies by themselves. If you’re interested in having some laser cutting or engraving done for an upcoming project of your own, please contact us! We would love to work with you!! 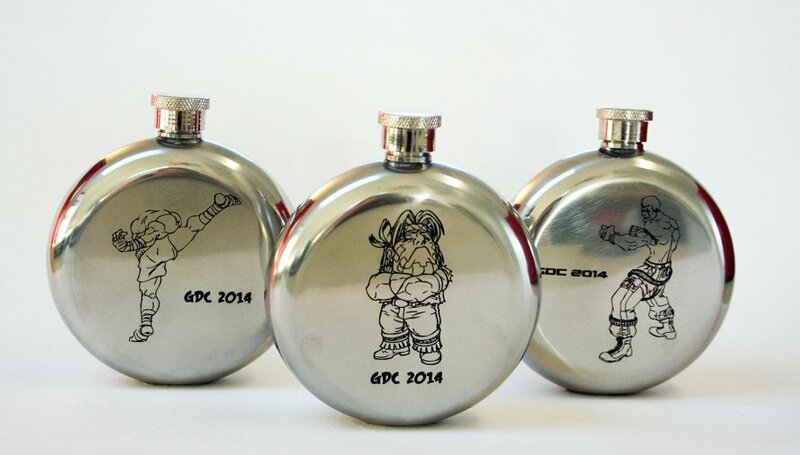 Laser-Engraved Stainless Steel Flasks! Oh Boy! Well, it’s Monday, and I love keeping my promises. 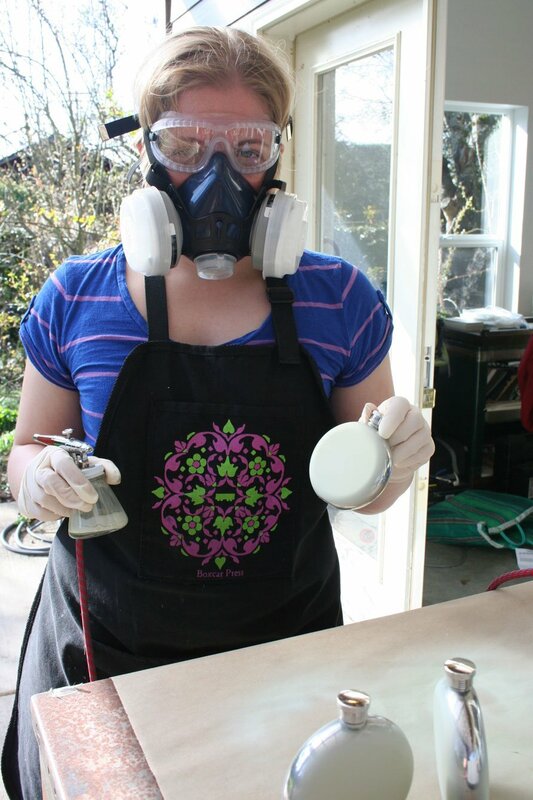 He and I were both so smitten with the result, that it got me thinking about how I could be using our laser cutter for multiple products, on a consistent basis, outside of the paper/stationery realm. 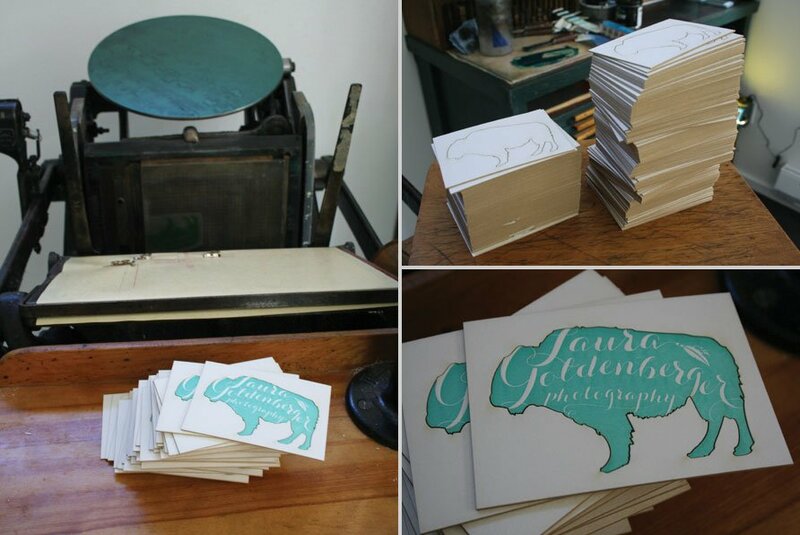 (Don’t worry, we’re still laser cutting lots and lots and lots of pretty paper goods as well!!) So, I did some more research into flasks. I mean, really, they’re kind of the perfect object. Almost everyone I know either is someone or know’s someone who loves a good whiskey (or other adult beverage) every now and then. Plus, the flask is a time-honored accessory, a great conversation starter, and a prime gift that fits almost any occasion. 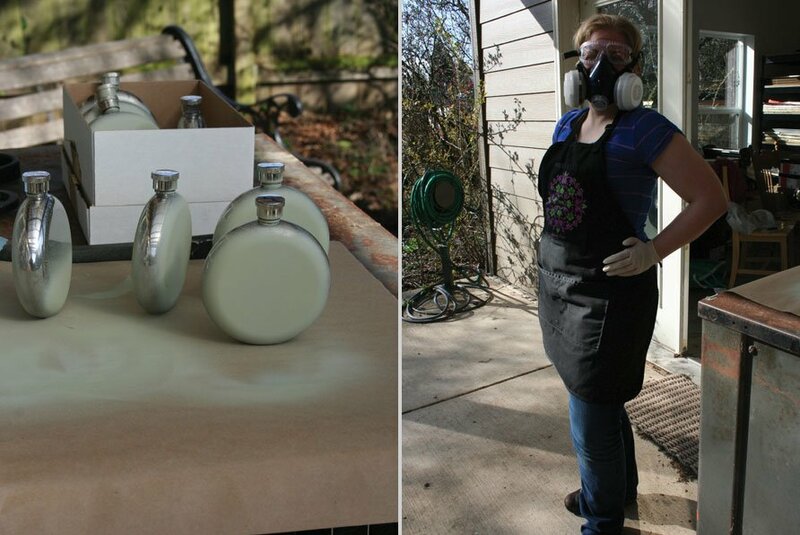 Below are images of the very first batch of flasks to come out of our engraver! All of these vary in theme, occasion, and design, but all are totally awesome!! The flasks we are currently carrying are round, stainless steel, and hold 5 oz. of your favorite beverage. 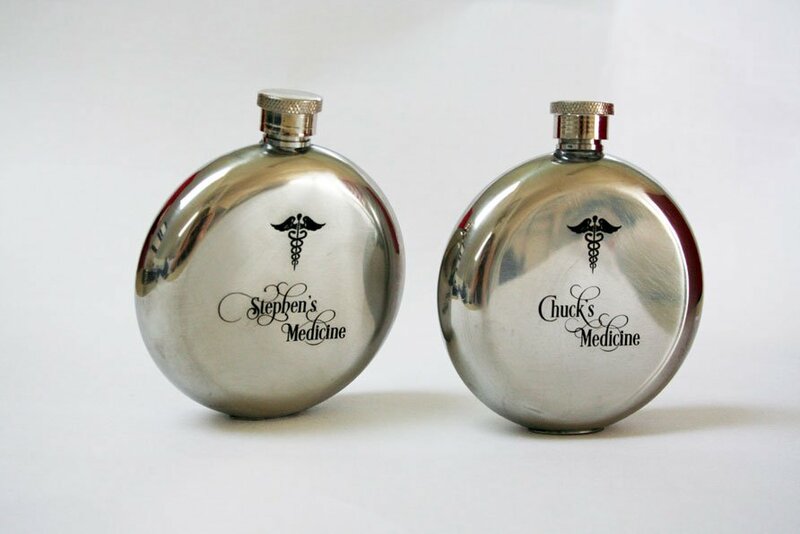 Custom engraving is available on all flasks, single or double-sided. These run come with a flask funnel, and run $28 each, or less if ordering in bulk. Please contact us for bulk pricing information, should you need more than one. 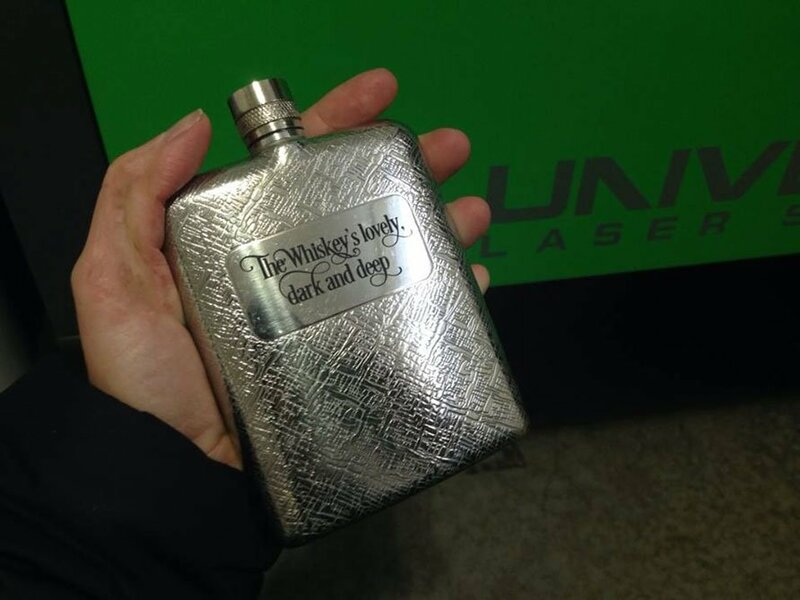 Custom metal engraving isn’t limited to stainless steel flasks! We are happy to entertain projects involving engraving on other types of metals or other types of products. Please contact us if you have an idea that you’d love to see us make happen! Lastly, as I love keeping marketing streamlined and consistent, I also am pleased to announce that with this launch, you will also soon be seeing more information on the launch of Twin Ravens Press’ sister company, which will be specializing in our new, non-stationery line of products. 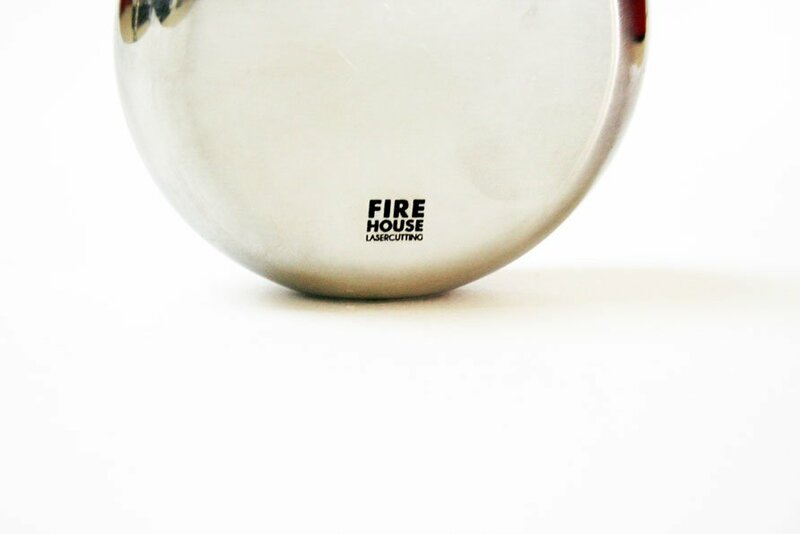 Please give a drum roll for Firehouse Lasercutting! More information, a website, Facebook page and blog to follow. Salut!! 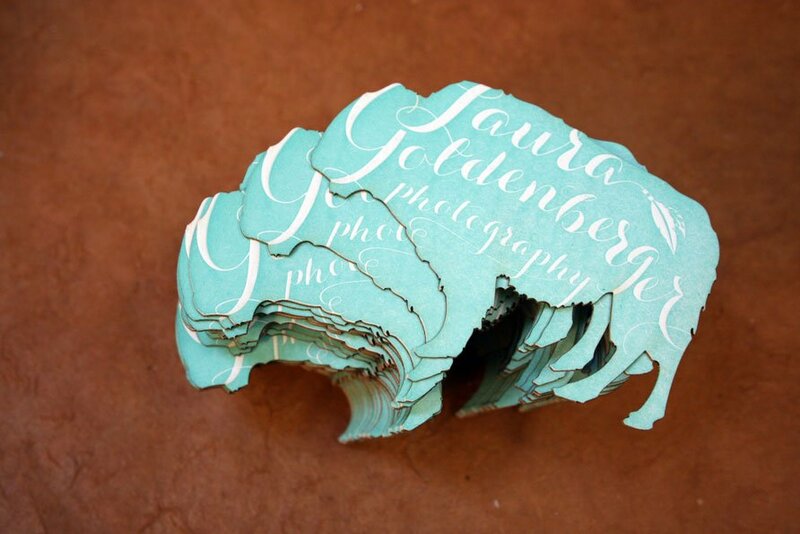 Check out the super-uniquely, awesome business cards we laser-cut and letterpress printed for Laura, of Laura Goldenberger Photography. Laura is a Los Angeles-based wedding and portrait photographer, with a bright and inviting style! Her business cards are one of the most unique sets we’ve had the pleasure of creating in a while! As you can see from the photo above, they’re a rather unique shape. 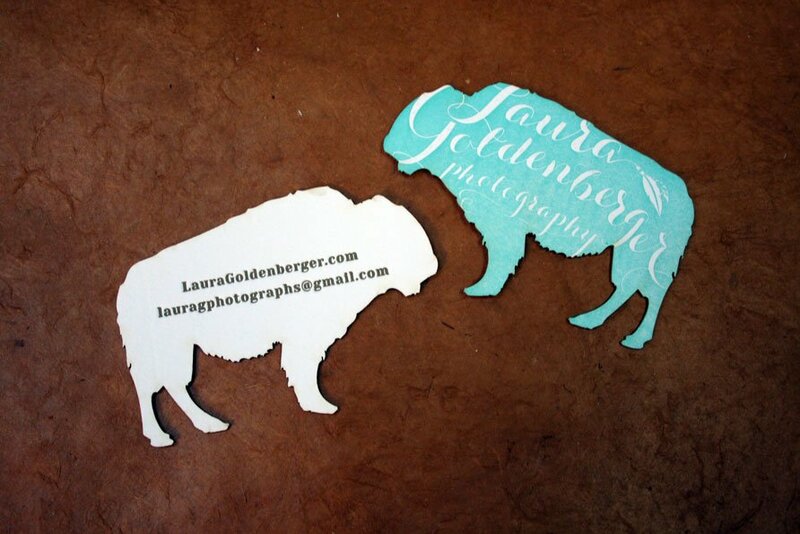 Laura’s cards were designed by OnePartGypsy and executed by us. These cards were laser-cut from super-thick, 100% cotton, duplex weight paper, and then printed double-sided on our letterpress, in two different colors: turquoise and gold. I took some photos of the process, which you can see below. Each individual buffalo was laser-cut with a frame around it ,and then each framed buffalo was individually fed into our press. The front side of Laura’s card was her logo in full-bleed turquoise, which made registration tricky, but created an awesome overall look! The back side was printed in gold ink with Laura’s website and email address. After they were printed, each buffalo was removed from its frame by hand. Aren’t they so cute, and absolutely memorable?!? I love custom-shaped things! If you want to learn more about Laura’s work, and check out her beautiful photographs, please visit her website or facebook page. She primarily shoots in Los Angeles and the Seattle area, but is willing to travel anywhere. Check her out! Need a great gift for a friend or family member’s upcoming wedding? 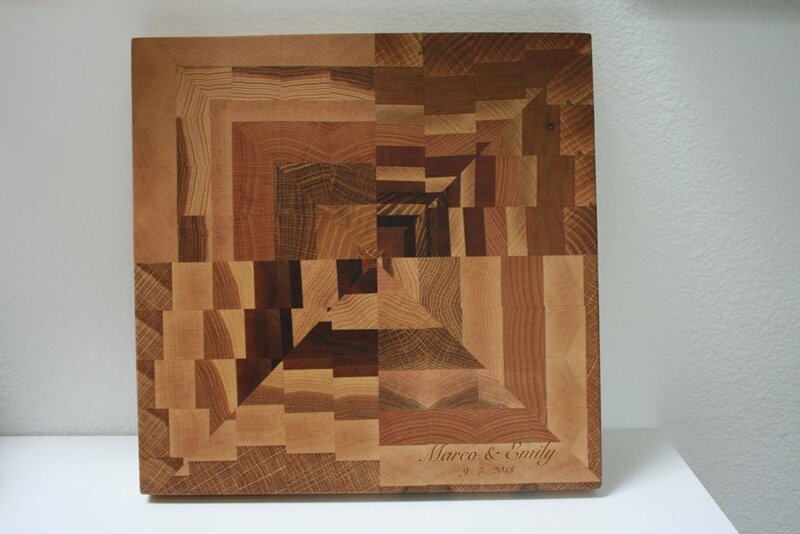 Wooden cutting boards make a unique, functional and beautiful gift for a wedding or other event! Check out this awesome one I finished engraving today for the Aunt of a bride who is getting married in September. This board was designed and created by my friend, Tim Boyden, of Out on a Limb Gallery. It measures approximately 10 inches square and is made of of various hardwoods. I then engraved the couples’ names and their wedding date in the bottom right hand corner, in the same font that they used for their wedding invitations! What a lovely gift! To see some of Tim’s other work, please visit his blog. 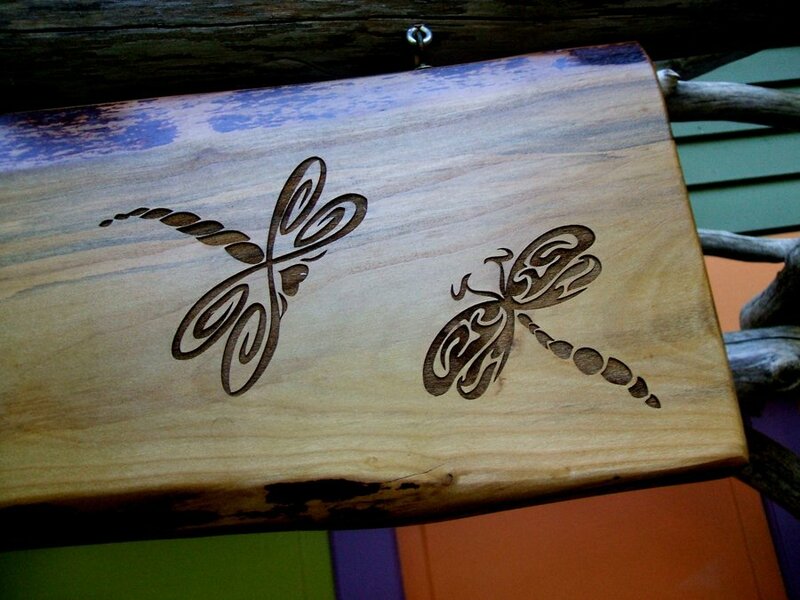 If you’re interested in ordering a cutting board or other laser-engraved item, please contact us, or Tim at Out on a Limb Gallery. Happy Friday, Everyone! Today I wanted to show off a recent project that’s quite a bit different than most of the work I do! 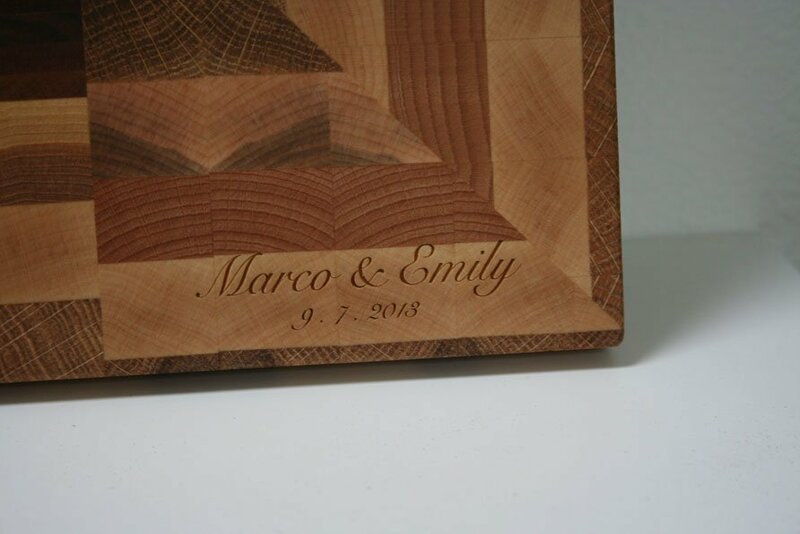 You’ve seen some of the laser-cut paper projects and invitations we’ve done before on this blog, but did you know, that we can also cut and engrave wood with our laser cutter?!? It’s pretty cool… I recently worked on a collaborative project with Eugene artist and woodworker, Tim Boyden, of Out on a Limb Gallery, on this special commissioned guitar stool for one of his clients. Tim creates all kinds of unique and eclectic furniture from wood and found objects. Some of the objects Tim incorporates into his furniture include bowling balls, old shoes, coins, river rocks, lamp shades, and musical instruments. You can see more of his work on his blog, or in person at Out on a Limb Gallery in Eugene. 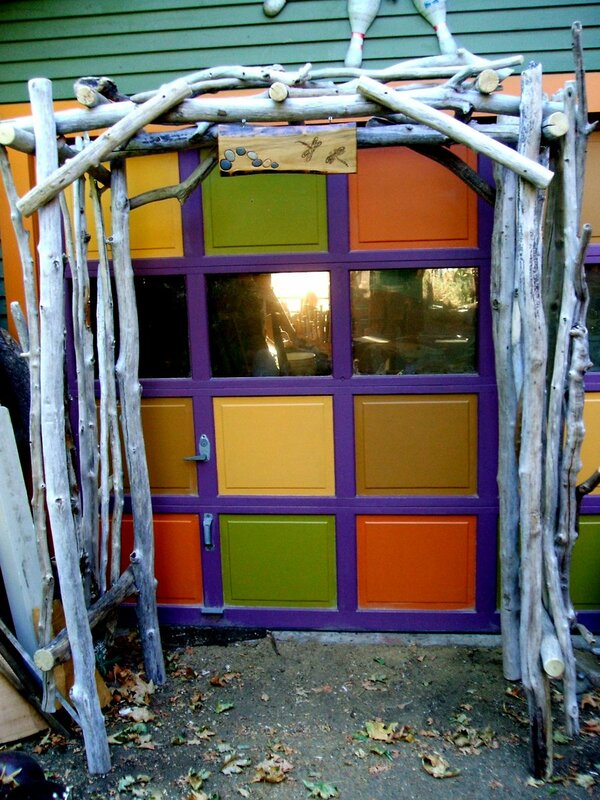 This particular project was a commission from one of Tim’s clients. 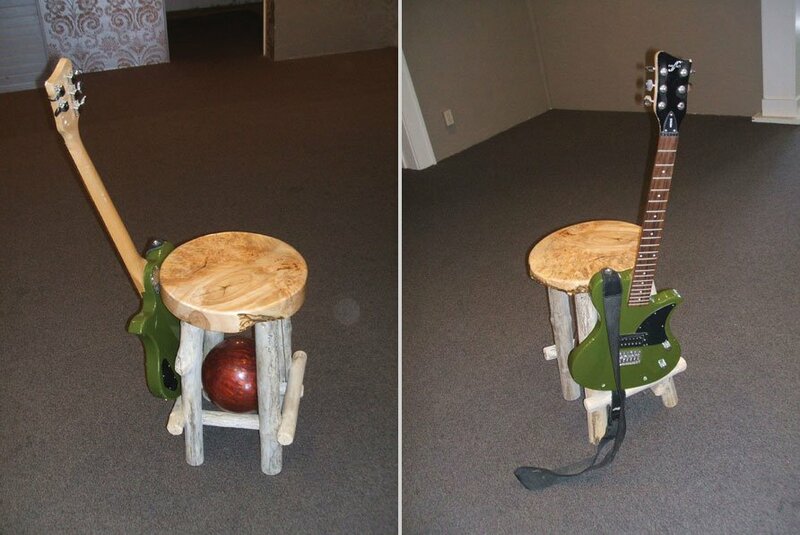 It’s a guitar stool made from a variety of woods. It has a bowling ball in between its legs for decoration and weight, and features a green electric guitar on the back. 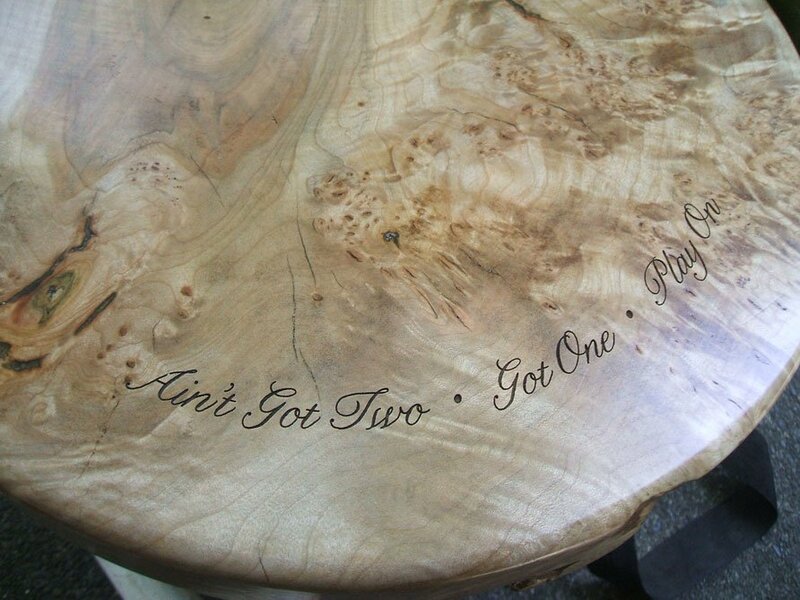 I used our laser cutter to engrave some custom text in the top of the seat of the stool prior to the stool’s final assembly. You can see the engraving work in the second photo below. Isn’t laser-engraved wood super-pretty?!? 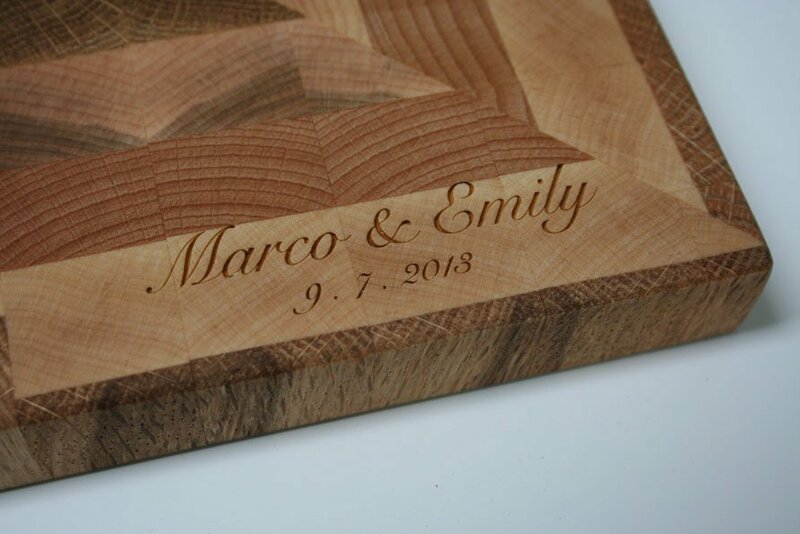 I can engrave in just about any type of wood, so long as the surface is flat and can engrave just about any font, text or imagery you might want. Think of the possibilities! I love working with Tim and the other artists at Out on a Limb and am looking forward to our next collaborative project! Happy Weekend!